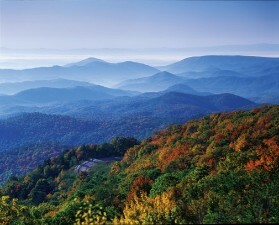 The Blue Ridge Mountains in Asheville, North Carolina, are beautiful year-round. For those that live close enough, a weekend drive to see the fall foilage is a great day trip. If North Carolina is too far for a day trip, it's a great place for a romantic getaway or family vacation. 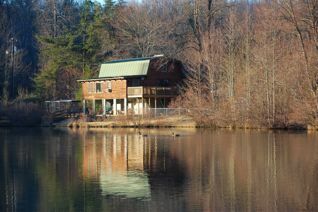 Accommodation options include private cabin rentals at Saluda Mountain Lake and Luxury Asheville Cabin Rentals. The cabins range in size to accomodate a variety of guest situations, from couples to large families, and offer many luxurious amenities for each individual cabin rental. 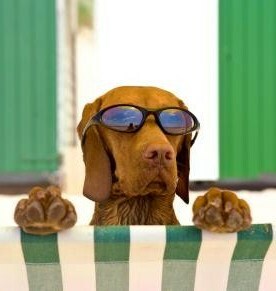 Pets are also welcome because the cabins are now pet friendly. Luxury Asheville Cabin Rentals and Saluda Mountain Lake offer eight different cabin choices, privately spread out over thirty five acres, which are accessible to the resort's own three acre spring-fed lake, regularly stocked with trout up to 22". All guests can enjoy the lake area and any scheduled activities. 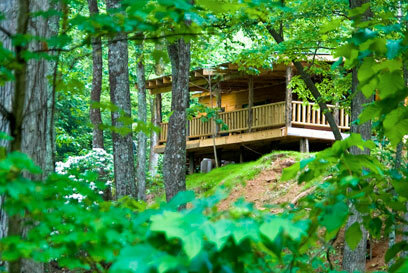 Asheville Cabin Rentals offer a choice of four luxury cabins, perfect for couples planning a romantic getaway. There are four larger cabins and lodges with various amenities, suitable for a variety of group or family sizes. 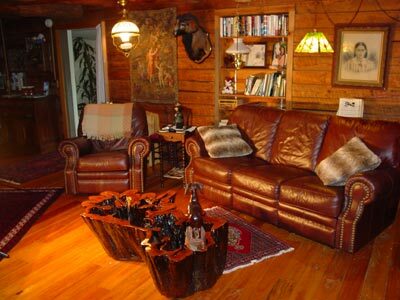 Log Cabin Retreat is a great cabin choice for couples. This private and secluded cabin lets a couple feel completely left alone by the outside world. The master bedroom has a hot tub right outside the bedroom on a large porch, overlooking the mountainside. 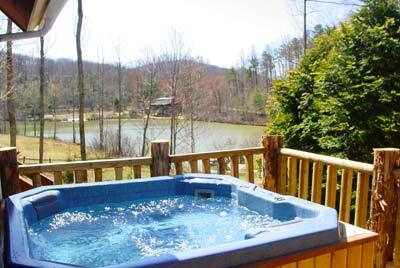 Soak in the hot tub or relax in the hand carved rocking chairs while cooking on the gas grill that is also available. If visiting this cabin in the winter, four wheel drive is recommended. For couples that don't own a four wheel drive one is provided to guests during inclimate weather. The cabin is not accessible any other way. Log Cabin Lookout , the newest cabin, is perfect for a weekend getaway or even a honeymoon. This cabin is strictly for couples only, children are not allowed. Zach's owl collection beautifully decorates this one bedroom cabin. The cabin has a full length porch, loft bedroom, and a reading room. A hot tub, gas grill, and rocking chairs are located on the porch. Soak in a hot tub while grilling out, then relax in one of the rocking chairs available to guests. The Tree House is a quaint little cabin that comes complete with a tree top bedroom with antique brass bed and breathtaking views. This cabin actually rests in the treetops, and is great for weekend getaways for couples. The cabin comes complete with all the amenities including: a full kitchen with all the appliances needed, gas fireplace, satellite television, wireless Internet, and linens. This cabin also has its own hot tub and grill outside on the porch, and the convenience of many nearby attractions. Log Cabin Hideaway is the only one of the four romantic couples cabins without a hot tub. it lives up to its name Hideaway , being secluded and private, and only accessible with four wheel drive vehicles during inclimate weather. 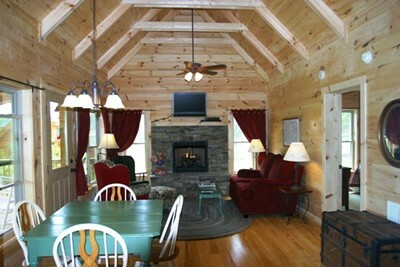 Asheville Cabin Rentals also has cabins to accommodate families or groups of various sizes. 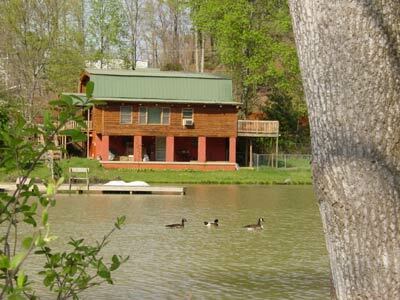 Just as with the smaller cabins, these cabins all have free access to the lake and all of its activities. 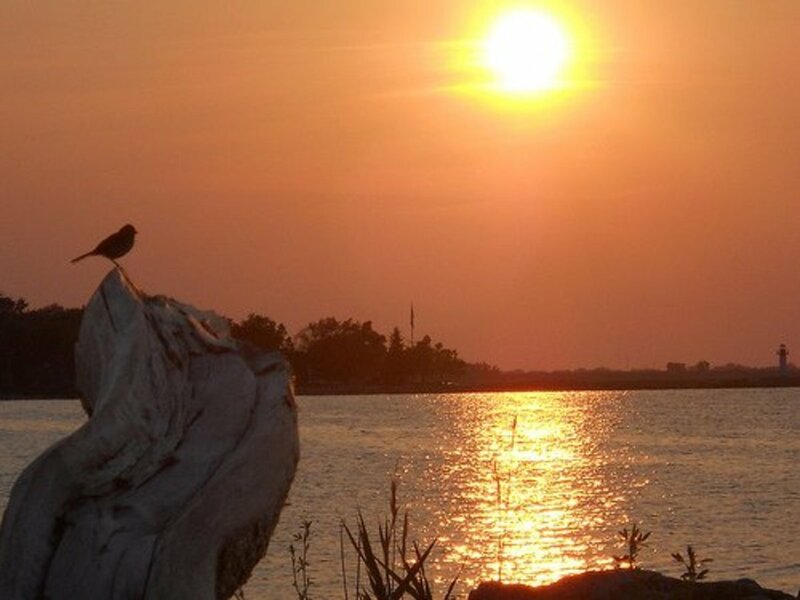 Bear Lake Lodge easily accommodates ten people, has three bedrooms and one master bedroom suite, and its guests have access to all of the activities available on this 35 acre retreat, including some secluded places for romantic couples to sneak off to. 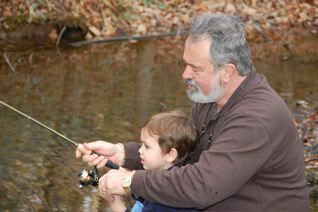 Enjoy trout fishing, walking trails, paddle boats, a waterfall, picnic area, and a small sandy beach-like area. Bear Lake is fully equipped with leather and hand carved furnishings, antiques, big screen TV and premium movie channels, and for kids and teenagers, a ping pong table, and professional air hockey table. The Lake House has a master bedroom, three slightly smaller bedrooms, and two baths. Two loft bedrooms overlook the main room and antiques below. 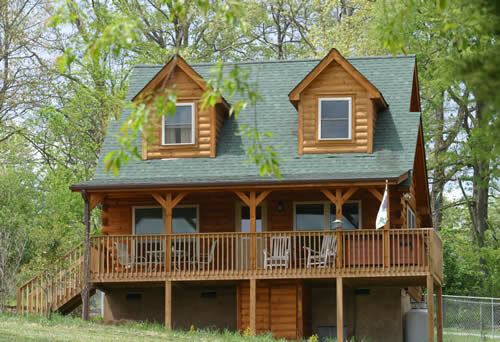 This cabin comes fully equipped with appliances, linens, and multiple decks complete with a barbeque grill and hot tub! A few of the Lake House's other amenities include: washer & dryer, big screen television, cable, wireless Internet, a fireplace, and stereo system. 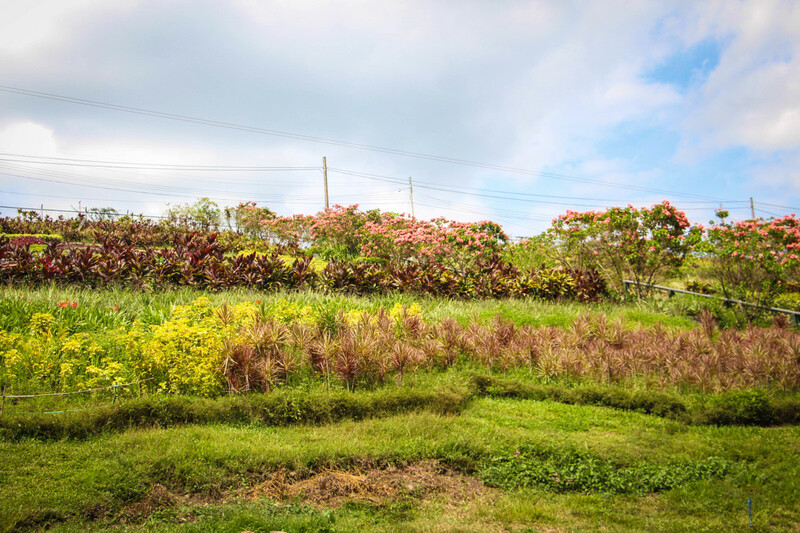 There is easy access for outdoor activities such as fishing, biking/hiking trails, and a swimming platform. Lake View Retreat has a private deck, complete with a hot tub and a nice view of the lake, , overlooking the top of the mountainside at 2200 feet. Lake View accommodates six guests with two master bedroom suites, three bathrooms, washer & dryer, and a wrap-around deck with a hot tub, furniture, and a grill. 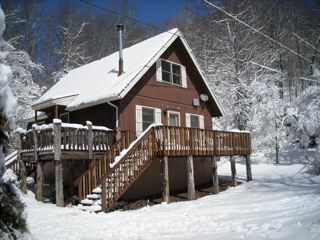 Bear Chalet overlooks the lake, with lakeside views, and is beautifully furnished. This quaint cottage has a fireplace, hot tub, and three bedrooms. All of these pet friendly cabin rentals can be found in the beautiful Blue Ridge Mountains in Asheville, North Carolina. For those who enjoy vacationing with their dogs, yet don't want to keep them confined, Barkwells offers pet-friendly luxury vacation cabins in beautiful western North Carolina. This is a secluded, fully fenced, mountain retreat, for you and your four-legged friends can enjoy vacation and freedom together. Please be sure that dogs are friendly towards people and other dogs. Diva's Cabin is the original cabin on the property.This cabin has 2 bedrooms, 1 1/2 baths, and an open living/ dining room with cathedral ceiling. The cabin has a hot tub and wide covered porch. Rover can come and go as he pleases through the dog door into a fenced yard. A few other amenities include: stone gas fireplace, hardwood floors, high speed internet service, fully equipped kitchen, satellite TV, all linens provided, and many other comforts of home. Snicker's Cabin has a beautiful cathedral ceiling in the living room, overlooking the lake and mountains. The master bedroom has a Kingsdown king-sized bed. The upstairs loft has two extra long twin beds with window seat and half bath. Snuggle up on the loveseat in front of the stone fireplace and TV. For the convenience of furry guests, a large chain link fenced yard and large dog door, make this a complete package. Peppermint Patty's Cabin with its pine floors and walls reaching up to the cathedral ceiling in the living room and loft above gives this log cabin a spacious and homey feel. The spacious master bedroom with fabulous king-sized Kingsdown bed is adjacent to the wheelchair friendly bath. A sleeping loft upstairs is accessible by ladder to a day bed and trundle. There is also another bedroom with two extra-long twin beds that can be combined to make a king bed. Lacey's Cabin is perfect for one or two couples with an open, yet cozy, design. The master bedroom has a king-sized Kingsdown bed, TV, and master bath with a jacuzzi tub. This cabin also has a large fenced yard and dog door. Watch dogs run and play while eating a relaxing meal outside under the 36' covered porch, complete with rocking chairs, a hot tub, and an outdoor dining area. Libby's Cabin is the largest log cabin with pine floors and walls reach up to the cathedral ceiling in the living room and loft above.It has two bedrooms and two full baths, and the upstairs loft has its own half bath. This cabin comes with all of the standard luxury amentities. Baxter's Cabin is a new two bedroom, two bath cabin with views of the beautiful horses grazing in pastures nearby. Full wall glass doors look out over the lake and mountains. This cabin is separated from the other cabins. The master bedroom has a king-sized Simmons Beautyrest bed and a flat panel TV. Plus, this cabin offers extras for their animal guests as well with dog beds and bowls, as well as dog towels for wet dogs. Bo's Hideaway is secluded from all of the other cabins inside its own gated drive. This cabin is newly renovated with two bedrooms and two baths. Both bedrooms have custom-made king-sized beds, vintage furniture and full baths. The sunroom has a day bed and a trundle for reading or catching a nap. Barkwells is located about twenty minutes from beautiful Asheville, North Carolina. Pets can enjoy the safety of the fenced yards and doggie doors, while their human counterparts enjoy some of the sights in Asheville. Outstanding hub, I really would like to visit this area of North Carolina west of where I have visited in the past. 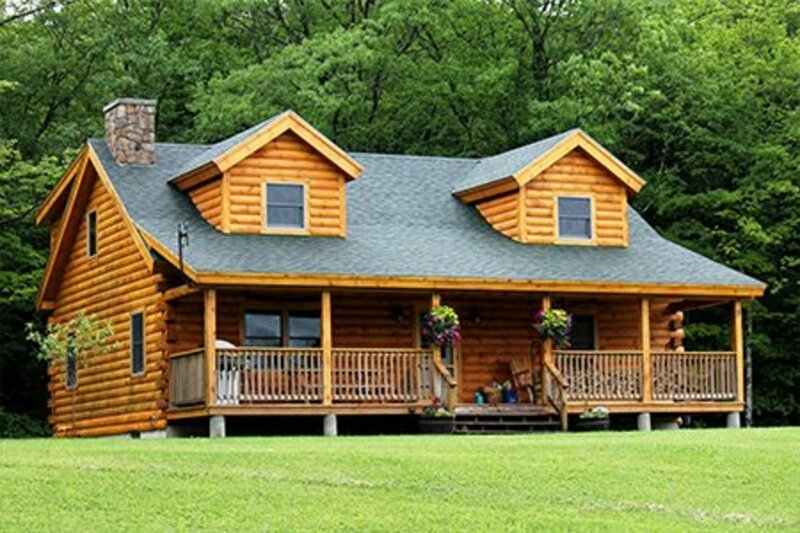 Theres nothing like a log cabin getaway.